My go-to diner order is a tuna melt. I love tuna fish and when it’s sandwiched between two toasty slices of bread along with some gooey melted cheese I’m in heaven. 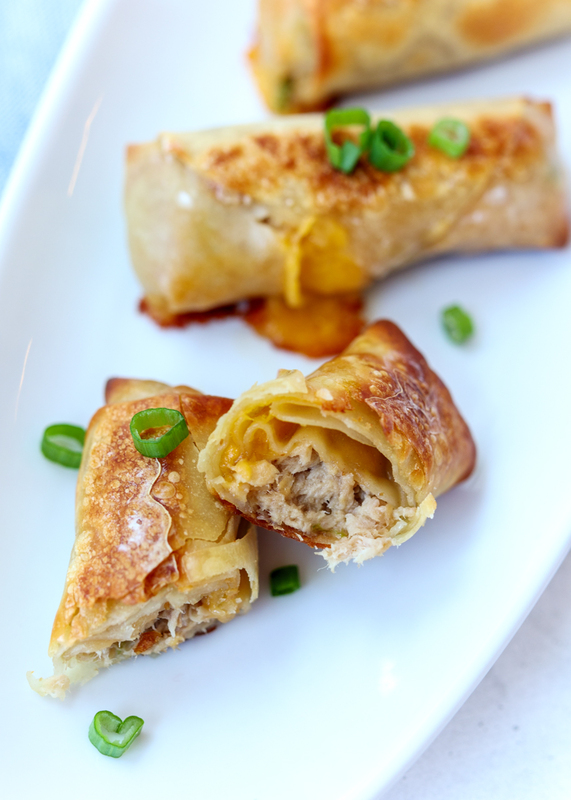 I had some leftover egg roll wrappers from the Baked Barbecue Chicken Egg Rolls and when I was brainstorming what I could make with them I thought of my favorite diner food. 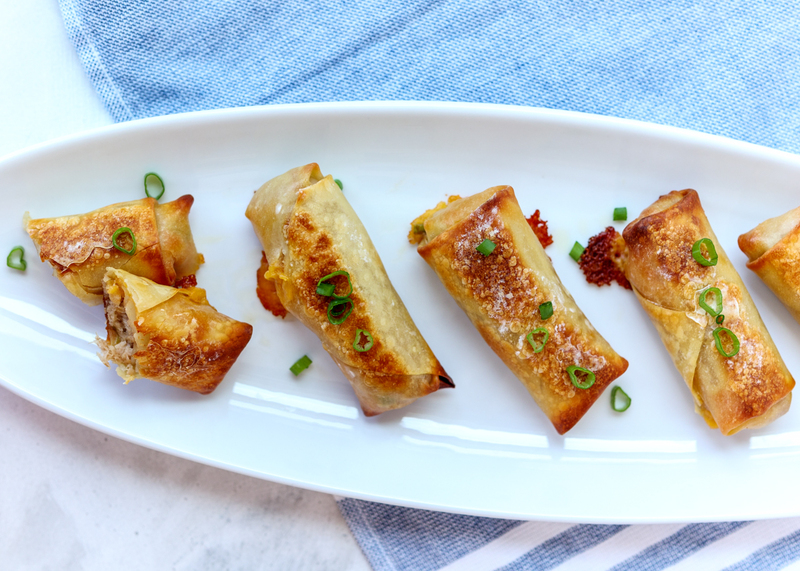 Skinnytaste turned me on to baked egg rolls with the Southwest Turkey Baked Egg Rolls from her cookbook and I’m constantly thinking of new variations. 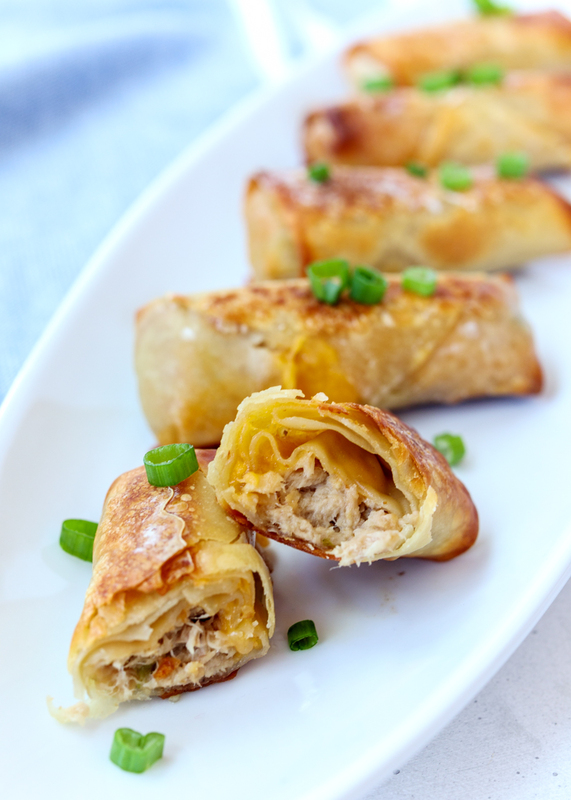 I stuffed the egg roll wrappers with cheddar cheese and a quick tuna salad I made with canned tuna, mayonnaise, scallions and fresh ground black pepper. Then I baked them until they were crispy and crunchy on the outside and had the perfect melted cheese in the middle. As I mentioned in my Pasta Tuna Salad post (if you love tuna fish then you will go nuts for that dish! ), Matt does not like tuna fish so I made these for myself for lunch. This is a small batch recipe as it only uses one can of tuna fish to make two servings. You could certainly make more if you are making it for more people, but I would not recommend saving them for leftovers as they taste best fresh from the oven. Now that I have those Goat Cheese Spinach Pesto Egg Sandwiches on my mind from Wednesday I’m thinking I missed an opportunity to put some everything but the bagel seasoning on the top of the egg roll wrappers just for some added flavor. I’m not sure if you’ve ever had tuna fish on an everything bagel, but it is so good. There’s this place I used to order from at work that would make a tuna melt on an everything bagel with some of the bagel scooped out so it would get nice and crispy. 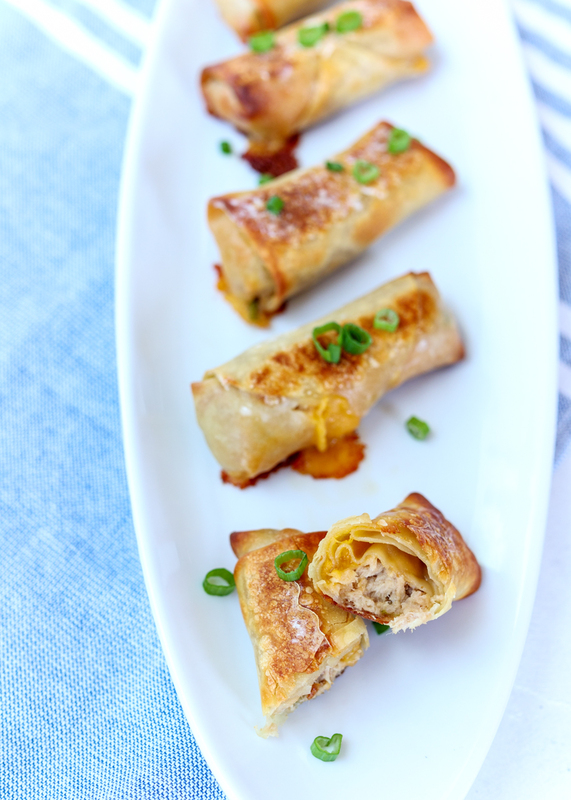 Like these egg rolls! Minus the everything but the bagel seasoning, but maybe next time! Preheat oven to 400 degrees F. Line a small baking sheet with nonstick aluminum foil or parchment paper and set aside. Combine the tuna fish, mayonnaise and chopped scallion in a bowl. Season with the black pepper. 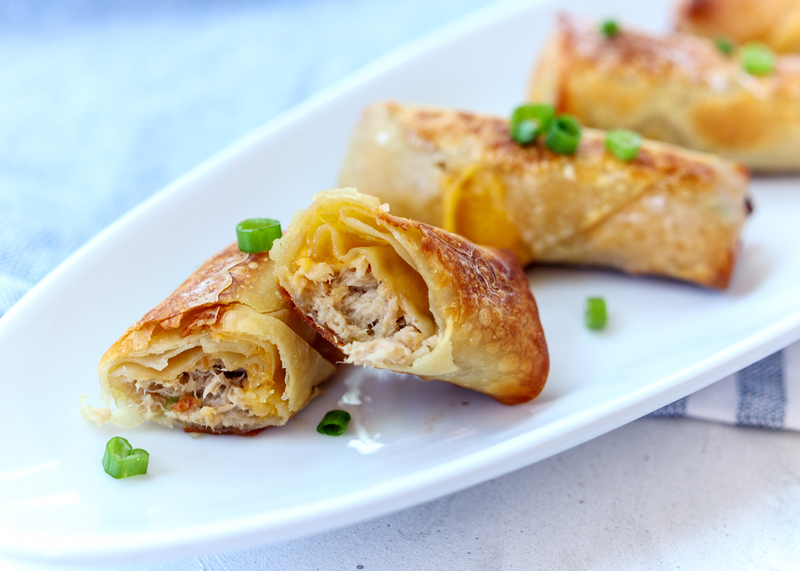 Before filling the egg roll wrappers, make sure you have a little bowl or cup of warm water and a clean work surface. Place the egg roll wrapper down so that a corner is facing you. Scoop ⅙ of the tuna mixture and place it near the bottom corner of the wrapper. I like to adjust the mixture so it’s more of a log shape then a big mound. Place a tablespoon of the shredded cheese on top. Take the bottom corner of the wrapper and fold it up and over the mixture so it’s completely covering it then continue to roll it one more time. Fold in the left and right corners so they create a little envelope then continue to roll it until it’s 1 roll away from the top corner. Wet your finger with the water and use it to moisten the whole exposed top corner. Fold the corner down to close up and seal the roll. Place it on the baking sheet. Repeat for the remaining rolls then coat all the rolls with cooking spray. Sprinkle with everything but the bagel seasoning if desired. Bake the rolls for 8 minutes, then flip them over and bake for another 8 minutes. They should be crispy and golden brown. Serve warm. Some of the links above are affiliate links, which means I may receive a small commission for my referral if you purchase something. This does not affect the retail cost of the item. Thank you for supporting Lemon & Mocha! Friends, we have another epic sandwich on our hands and I’m having trouble containing myself yet again. 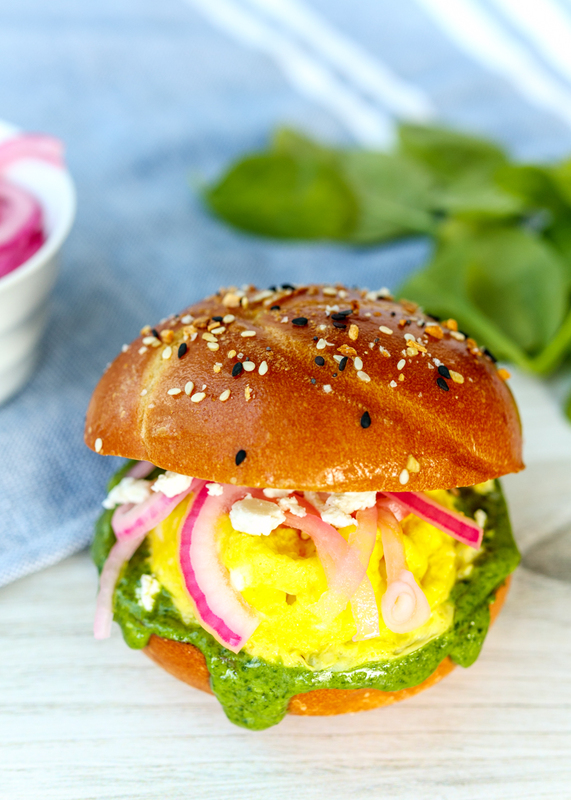 This little breakfast sandwich is savory, creamy, tangy and a whole lot of deliciousness. My inspiration for this sandwich came from a little weekday date Matt and I had. There is a cafe near Matt’s office and a couple months ago we had lunch there together. 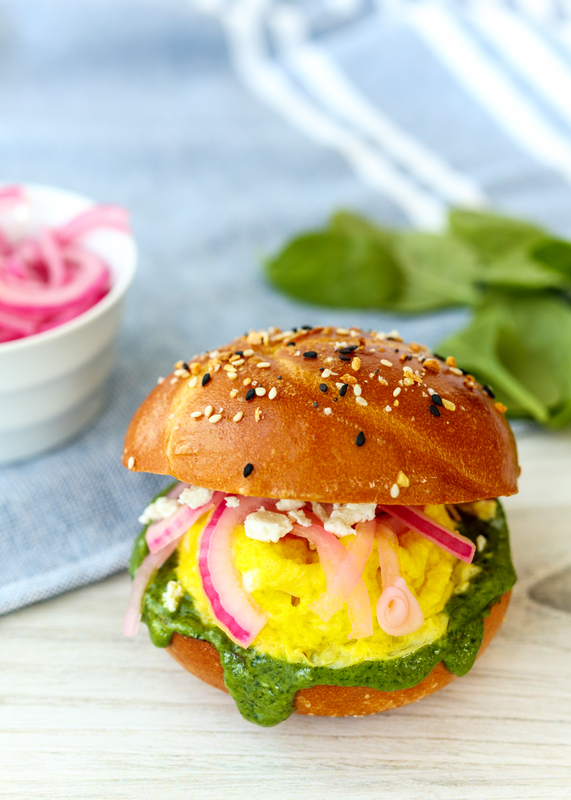 I got this crazy delicious egg sandwich with spinach, pesto, goat cheese and pickled red onions on a buttery roll. I’ve been craving it ever since so I decided to re-create my own. Instead of keeping all the components separate I made the pesto with spinach and goat cheese. I’ve made spinach pesto before, but I’ve never used goat cheese in my pesto. Oh my goat cheese heavens! It made the pesto so creamy and gave it the consistency of almost a pesto spread. Which could not be more perfect since it gets spread right onto these toasted kaiser rolls. These are the same rolls from the Barbecue Meatloaf Sandwiches with Caramelized Onions and I used the same egg wash method with everything but the bagel seasoning since I’m channeling breakfast. 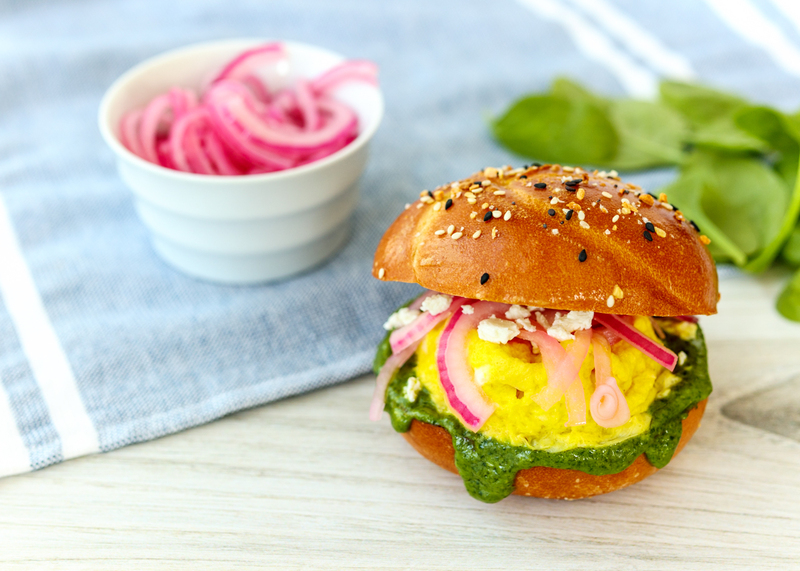 You really could eat this sandwich for any meal, but I wanted to include some of those breakfast flavors since we’re working with eggs. Next, we have the scrambled egg patty. You could scramble your eggs in a pan, but if you cook the egg in a ramekin in the microwave then it will be the perfect shape for egg sandwiches. 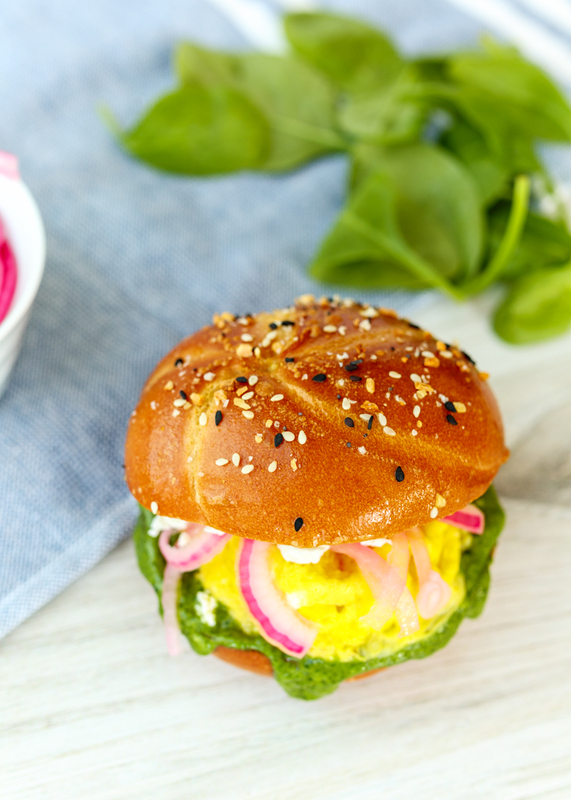 Finally, after being slathered with goat cheese spinach pesto, it gets topped with some tangy Quick Pickled Red Onions and some additional creamy goat cheese. Yum! Okay, back to the goat cheese spinach pesto because I’m still not done talking about it. The recipe below makes more pesto than you will need for the sandwiches, which is amazing because then you can either a) make even more sandwiches with it or b) use it on everything for the next few days. I had the pesto on chicken, mixed in with rice, on turkey sandwiches and stirred into pasta with shrimp. I couldn’t get enough of it and was very sad when we used it all up. I guess that just means I have to make it again soon! Puree the spinach, nuts, garlic and salt in a food processor. Add the olive oil and continue to pulse until smooth. Add the goat cheese and pulse until smooth. Set aside. Beat 1 of the eggs in a small bowl then add 1 tablespoon water. Brush the tops of the buns then top with everything but the bagel seasoning. Toast in your toaster oven or oven. Spray 2 small ramekins or microwave-safe bowls with cooking spray. Beat each of the remaining 2 eggs in their own ramekin and season with salt and pepper. I usually add a splash of milk. Lightly cover and microwave for 1 minute. 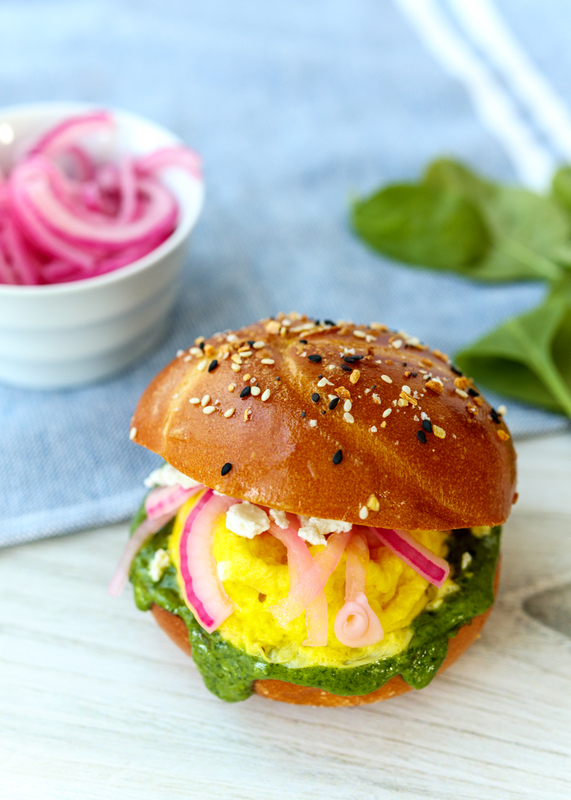 To make the sandwiches, spread the bottom of each bun with some of the goat cheese spinach pesto. Carefully remove the egg from the ramekin and place on top along with the pickled red onions and additional goat cheese, if desired. You can use whichever type of nut you prefer in pesto; I would recommend toasted pine nuts, almonds or walnuts. Alternatively, you could use 3 tablespoons of pumpkin seed butter instead as that is what I used for this recipe. 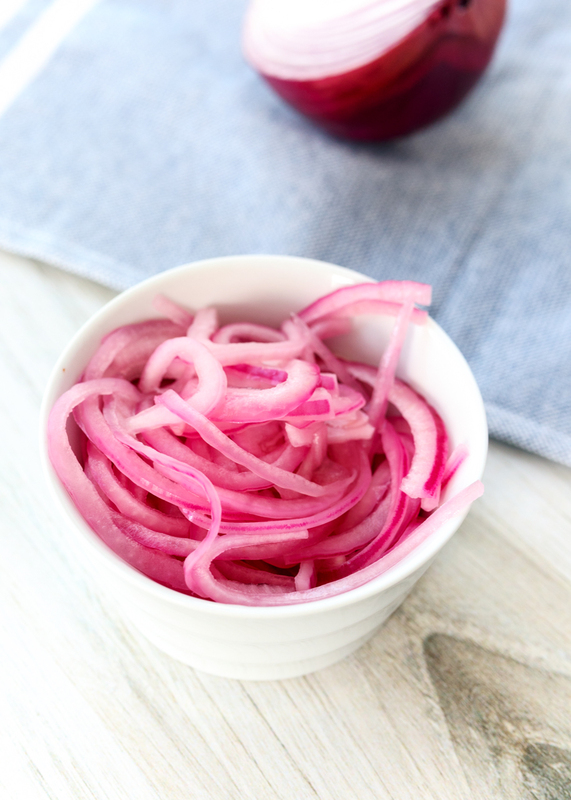 This recipe for Quick Pickled Red Onions has to be the easiest recipe I’ve ever posted on Lemon & Mocha. Which is perfectly okay because easy is great. 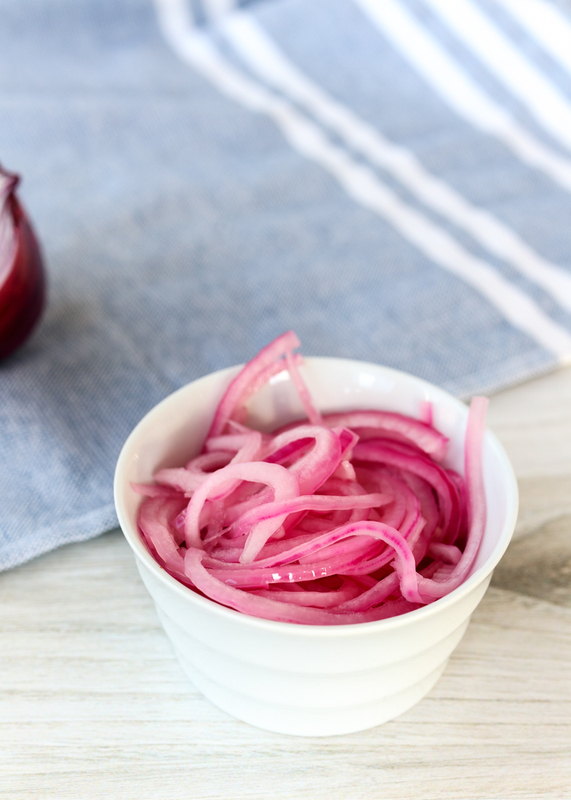 Easy means you can make these mild and tangy pickled red onions anytime you want! Especially when there’s only five ingredients and those five ingredients are water, apple cider vinegar, sugar, salt and red onion so it really doesn’t get much more simple than that. The reason pickled red onions are so amazing is because they bring the perfect amount of acid to a dish. 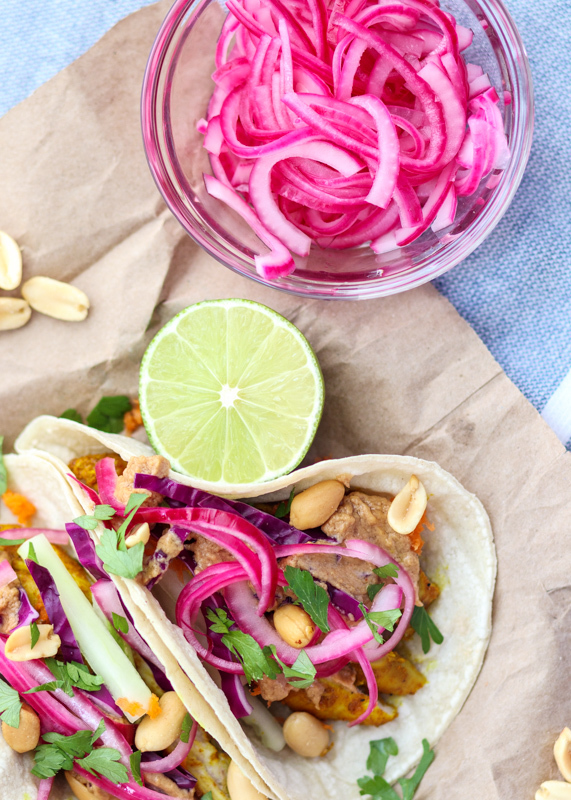 Remember the Thai Peanut Chicken Tacos? 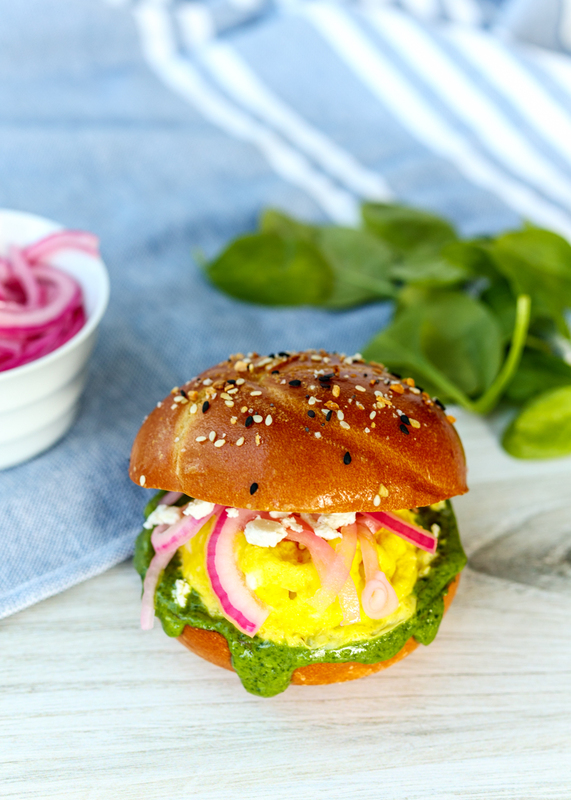 The addition of pickled red onions helps burst through the rich and savory peanut flavors to bring some much needed brightness to each bite. Aside from tacos, my other favorite way to eat pickled red onions is on a salad. When I have a batch of them in the fridge it’s such an easy topping to throw on my salads for an added crunch and punchy flavor. Putting pickled red onions on grilled cheeses and grilled sandwiches is another favorite in our house. I’m sure there’s plenty of other delicious ways to use pickled red onions, but after some tacos, salads and a few sandwiches ours are already used up so I haven’t experimented with other uses! 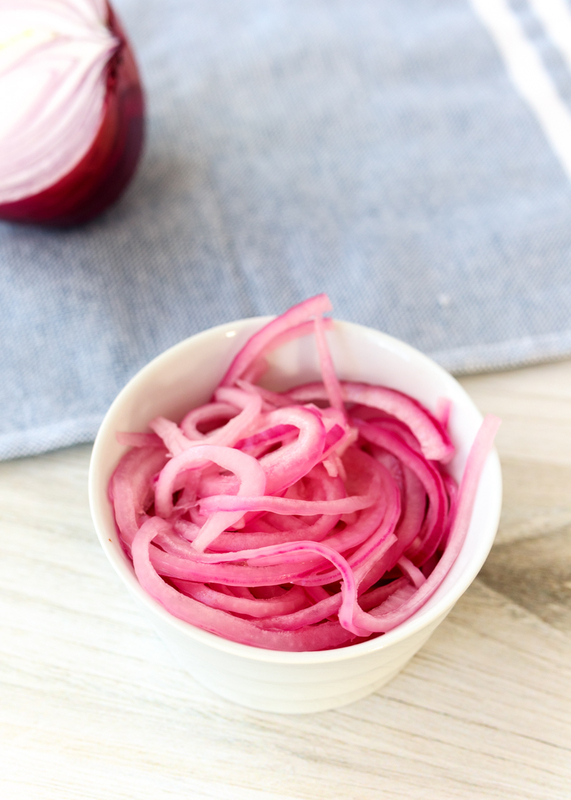 To make pickled red onions you heat water, apple cider vinegar, sugar and salt in a small saucepan. Once the sugar has dissolved – it’s only 1 1/2 teaspoons – you pour the warm mixture over the thinly sliced onions in a bowl. Let them sit for one hour and then you’re well on your way to effortlessly taking your meals up a notch! Combine the water, apple cider vinegar, sugar and salt in a small saucepan over medium heat. Stir until the sugar dissolves then remove from the heat. 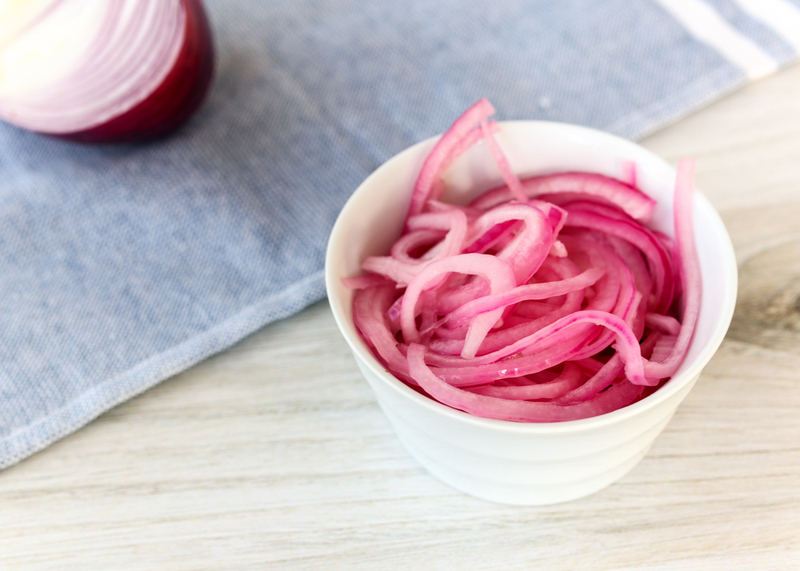 Place the sliced red onions in a bowl then pour the vinegar mixture over top. Let sit at room temperature for 1 hour. I have to admit that I was completely dreading these March cookies from the Food Network Magazine. The photos looked incredibly intimidating, especially since it’s a magazine so of course the rainbow cookies in the photograph was absolute perfection. 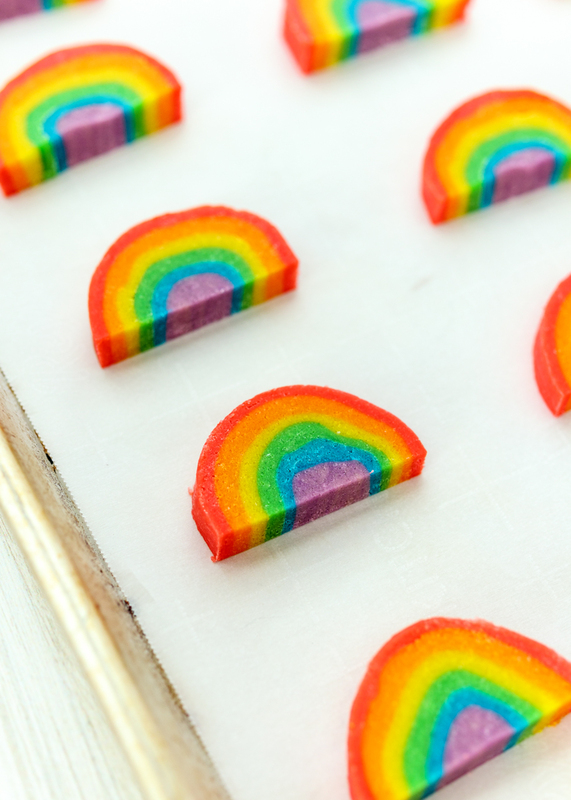 Then I looked at the recipe and saw it involved tinting the cookie dough six, yes, six, different colors and these weird instructions for rolling, measuring and wrapping the dough that somehow gives you these cool rainbow cookies. I’m committed to completing this monthly cookie challenge so I rolled my sleeves up and dove in. The actual cookie dough is a very simple, buttery cookie recipe. You then divide the dough into six pieces so you’re going to want to make sure you have a lot of bowls ready! I used my kitchen scale to divide the dough since the recipe specified the amounts in ounces. Side note: if you don’t already have a kitchen scale, I highly recommend one if you do a lot of baking. They are fairly inexpensive (under twenty dollars) and are necessary for many baking recipes. Particularly for when you are baking something with layers, for example I make Matt those Italian tricolor cookies every Christmas and it is definitely key to make sure each of those thin layers has an exactly even amount of batter. 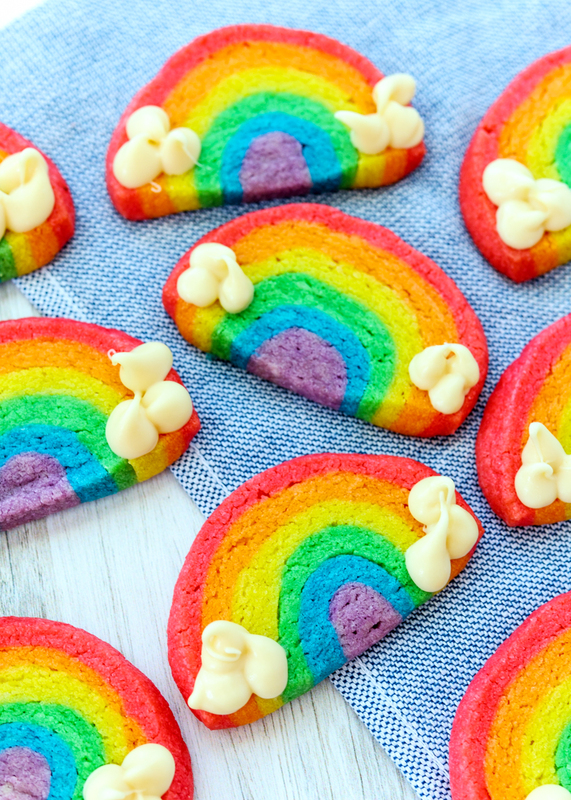 Anyways, back to these crazy rainbow cookies! So once you have your dough divided up you tint each section with gel food coloring. Food coloring typically comes in a pack of red, yellow, green and blue. You could combine colors to make the orange and purple, but I used the same neon gel food coloring that I used for my Chocolate Marshmallow Monster Cookie Sandwiches, which ended up being a lot easier and didn’t use up all of the red food gel. Now, I bet you’re wishing I would stop babbling about food coloring and are wondering how to get that cool layered rainbow shape! The gist of it is that the purple section gets rolled into a log. The blue section then gets rolled into a rectangle that wraps around the log, then the green section gets rolled into a slightly larger rectangle that wraps around the now larger log and so on until you have a big roll of cookie dough. After the dough log has had a chance to chill, you slice rounds, like a classic slice-and-bake cookie, then cut each round in half to get that rainbow half-circle shape. Voila! I was relieved to discover that making these cookies wasn’t as bad as I anticipated, but if I ever had a desperate need for rainbow cookies in the future I would most likely just pipe rainbow frosting on top since mixing gel food coloring into cookie dough – six times – takes far too long to make it worth it in my opinion. What do you think? 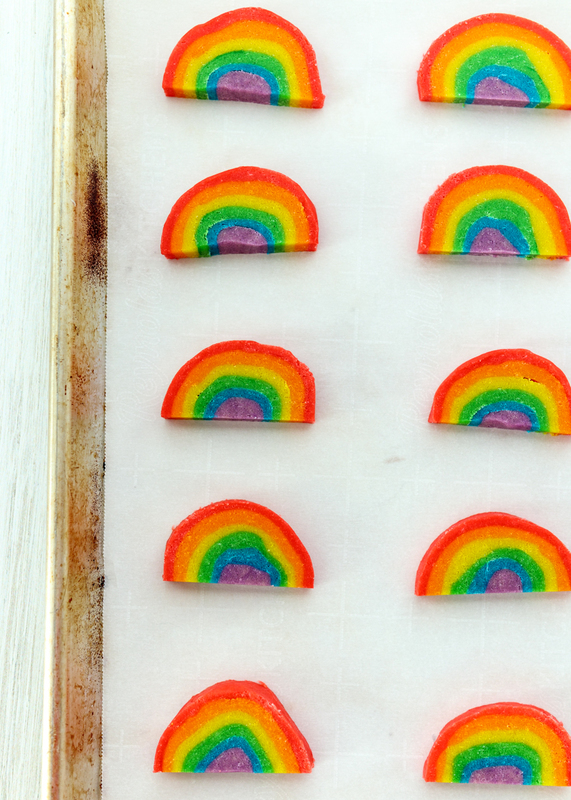 Would you give these pretty Rainbow Slice-and-Bake Cookies a shot? In a medium bowl, sift together the flour, baking powder and salt. In the bowl of a stand mixer or in a large bowl with a hand mixer, beat the butter, granulated sugar and powdered sugar on medium-high speed for 2 minutes, or until light and fluffy. Add the egg yolks and vanilla then beat to combine. Gradually add the flour mixture on low speed until just combined. Divide the dough: 2 large pieces (about 7 ounces each), 2 medium pieces (about 5 ounces each) and 2 small pieces (about 3 ounces each). Tint 1 of the large pieces of dough red and tint the other one orange. Use a rubber spatula (so it doesn’t stain) to work the food coloring into the dough. Repeat with yellow and green for the 2 medium pieces of dough. Repeat with blue and purple for the 2 small pieces of dough. Lay a piece of plastic wrap, about 12 inches long, on a clean work surface. Take a large piece of wax paper, about 12 inches long, and lightly flour it. Put on gloves so you won’t get food coloring on your hands and so you can easily move from one color to the next. On the floured wax paper, roll the purple dough into a 7-inch log. It will be about ¾-inch thick. Set aside on the plastic wrap. Brush any purple dough off your gloved hands or the wax paper; dust with more flour if needed. Use a rolling pin to roll out the blue dough on the wax paper into a rectangle, roughly 3½ inches by 7 inches. Place the purple log on the edge of the blue rectangle and use the wax paper to help you tightly roll it around the purple log, lightly pinching the seam where the 2 long blue edges meet. Set the log back aside on the plastic wrap. Brush any blue dough off your gloved hands, the wax paper or the rolling pin; dust the wax paper with more flour if needed. Repeat for the remaining colors, in these sizes and in this order: green 5 inches by 7½ inches; yellow 6 inches by 8 inches; orange 7 inches by 8½ inches; red 8 inches by 9 inches. Wrap the plastic wrap around the whole log then refrigerate for 8 hours or overnight or place in the freezer for 1 hour. Preheat the oven to 375 degrees F. Line 2 baking sheets with parchment paper and set aside. Cut the ends off of the log. Slice into ⅜-inch thick rounds then slice each round in half. If any of the cookies have a slight gap between the layers in spots just gently press them together. 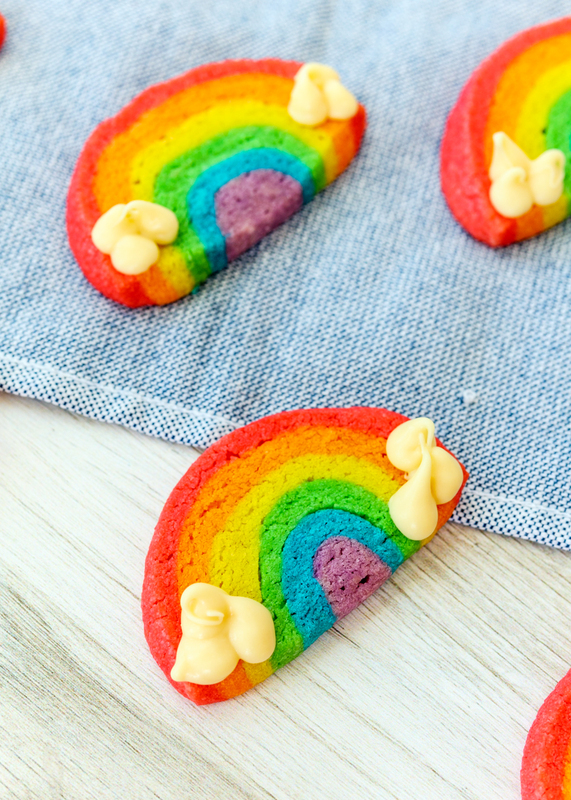 Place the rainbow cookies about 1 inch apart on the prepared baking sheets then place them in the fridge for at least 15 minutes. This helps prevent spreading when they bake. Take one pan out of the fridge and bake the cookies for 10-13 minutes. The cookies will be just set around the edges. 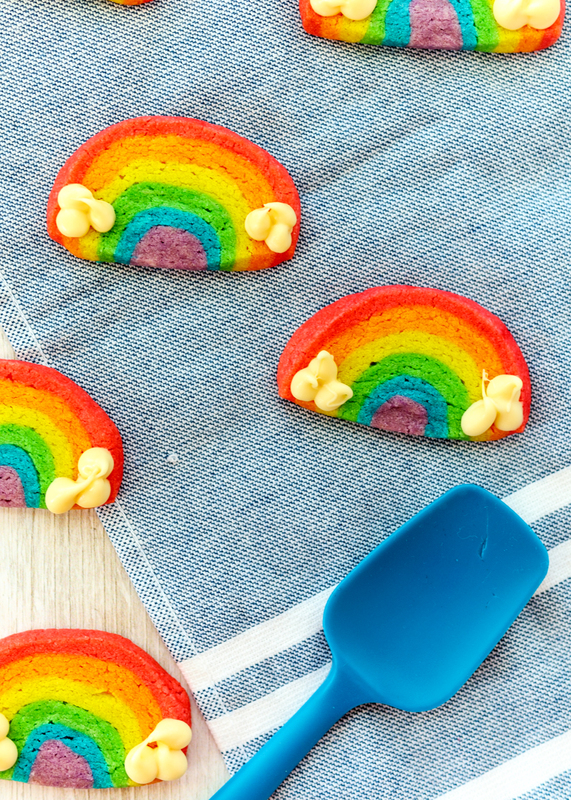 When you take them out of the oven, if the bottoms of the rainbow have puffed out a little, carefully use a spatula to help press the bottom of the cookie to be flat. You have to do this while they’re right out of the oven because once they cool their shape will be set. Let the cookies cool on the pan for 5 minutes then transfer to a wire cooling rack to cool completely. Remove the second baking sheet from the fridge and repeat the baking and cooling instructions. Once the cookies are completely cooled, melt the candy melts in a microwave safe bowl for 30 seconds, stir, then continue microwave and stirring in 20 second intervals until smooth. Place the melted candy melts into a pastry bag fitted with a small round tip or in a resealable plastic bag with the corner snipped. 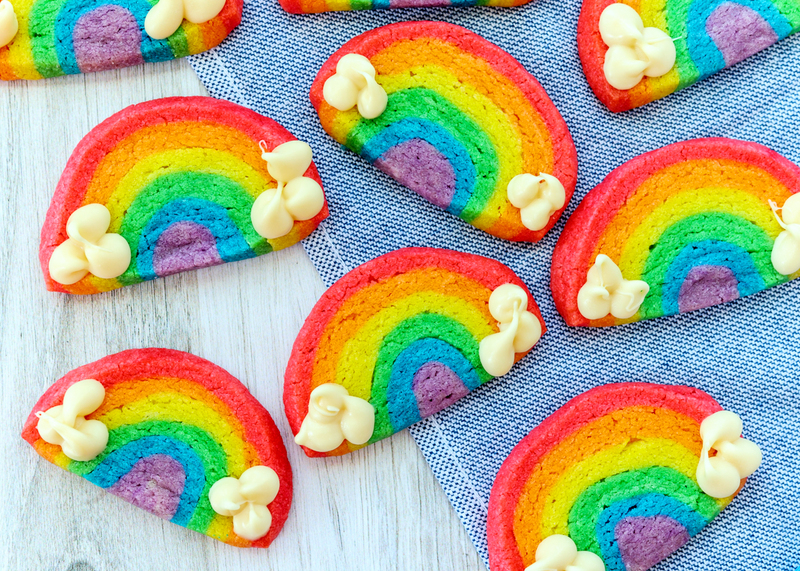 Pipe the little clouds on the ends of each rainbow cookie then let set for at least 5 minutes. Recipe from January/February 2019 issue of Food Network Magazine . Some of the links above are affiliate links, which means I may receive a small commission for my referral. This does not affect the retail cost of the item. 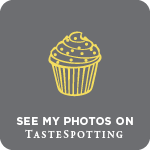 Thank you for supporting Lemon & Mocha! Now this, my friends, is how to truly enjoy hummus. 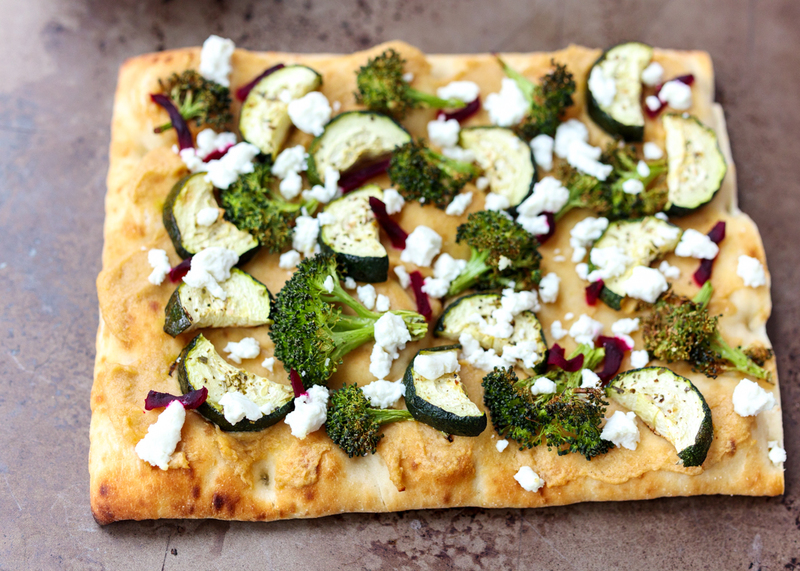 I thought I had a love for hummus, but this Hummus and Roasted Veggie Flatbread Pizza just deepened my love ten-fold. Pita chips dipped into hummus is great. Warm, soft pita wedges dipped into hummus is even better. 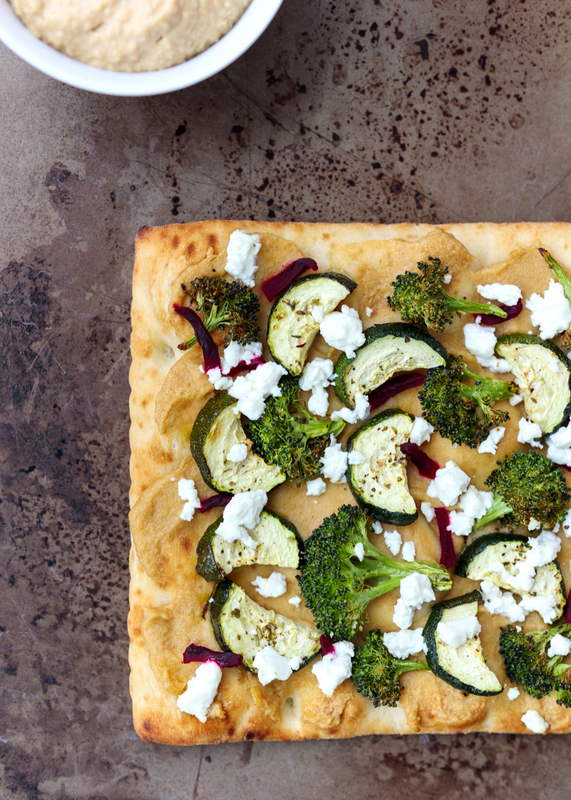 But a toasted pizza crust topped with warm hummus, roasted vegetables and slightly melted goat cheese is the hands-down winner. 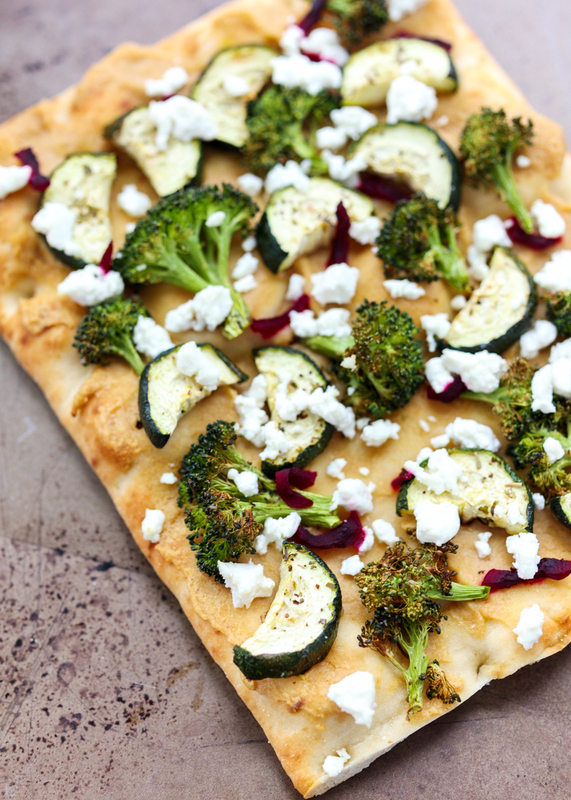 I used Monday’s Caramelized Onion Hummus to make this flatbread pizza and the rich flavor balanced with the roasted zucchini and broccoli was perfect. The beauty of this dish is you can really customize it any way you would like. Swap out the hummus flavor, your favorite veggies or even add some additional protein, like some grilled chicken. 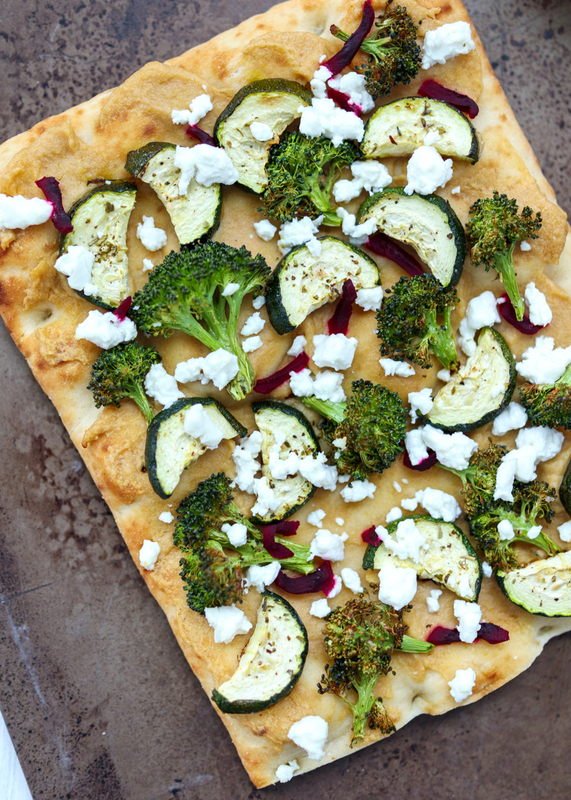 Or just make it with whatever is in your fridge because once you get the thought of a hummus pizza in your head nothing will matter until you are blissfully taking bites of the warm and crispy hummus-slathered flatbread. I found these new pre-made rectangular pizza crusts at Trader Joe’s. They were giving out samples of them covered in pesto and gooey mozzarella so of course I got a few to stock up. They were super long so I cut them in half and popped them in my freezer. I would definitely recommend them, although naan bread, pita bread or any other type of pre-made flatbread would work well for this hummus pizza. One key recipe step that I want to point out is that you have to spread the hummus on the pizza before putting the flatbread in the oven. Hummus spread on a warm pita is one thing, but hummus baked on a pizza crust is an entirely different experience. The hummus gets warm and bakes onto the crust. So good! Have you ever had a hummus pizza? Preheat oven to 400 degrees F. Line a baking sheet with nonstick aluminum foil or parchment paper. 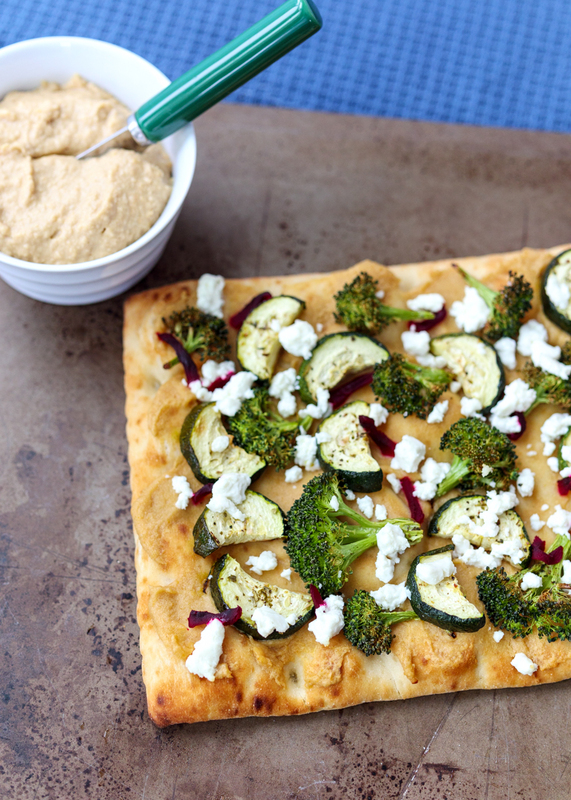 Place the broccoli florets and zucchini pieces in a single layer on the baking sheet. Lightly spray with cooking spray. Season the veggies with salt, ground black pepper, garlic powder and Italian seasoning. Roast for 20 minutes, or until tender and lightly charred. Divide the hummus between the 2 flatbreads and spread in an even layer. 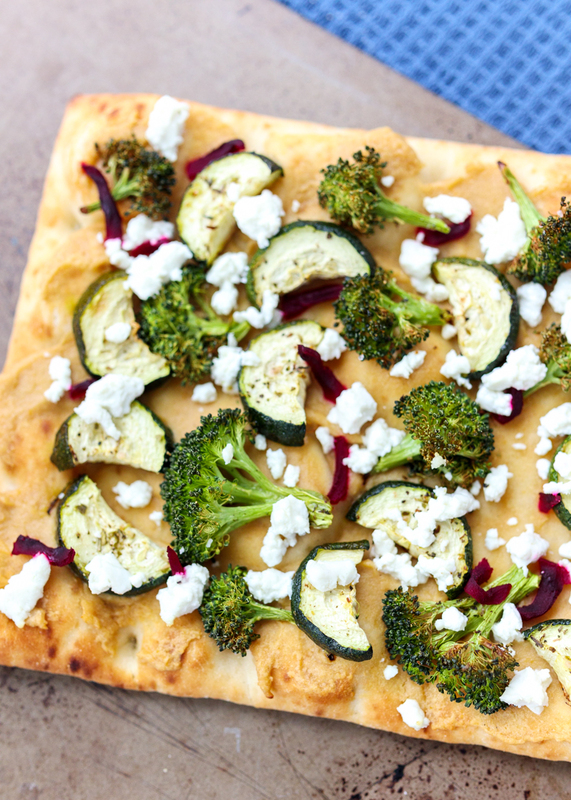 Divide the roasted veggies, raw beets and goat cheese crumbles between the flatbreads. Bake at 400 degrees for 5-7 minutes, or toast in your toaster oven, until the flatbread is warm and the goat cheese is slightly melted.